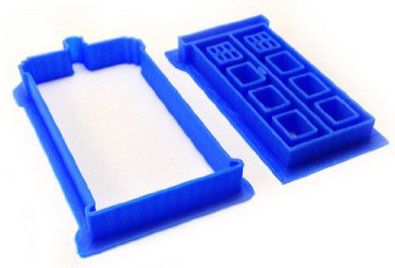 What’s in Amazon’s 3-D Printing Store? It’s been six months since Amazon opened their cutting-edge 3D Printing store — and since then, it’s been stocked with many new weird and wonderful products. They’re created on demand, meaning you can add any thing you want, whether it’s your name, your initials, or even a likeness of your own face. Here’s my selection of some of the most interesting new items. 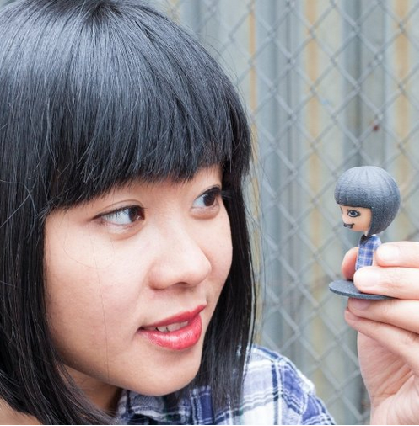 imagine buying a bobblehead that’s been customized so it looks like you! You can choose the bobblehead’s eye color, hair color, and hairstyle, and even add eyeglasses. (See a picture at the top of this page.) 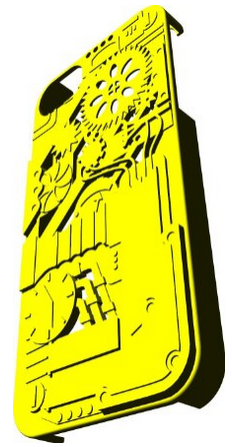 Even the spring inside the bobblehead is generated by the printer, and it’s only when the bobblehead is produced. 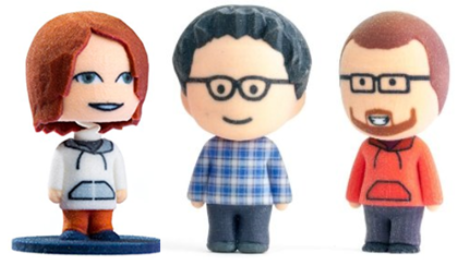 “Turn yourself, friends, family, and coworkers into bobble heads,” reads the product’s description on Amazon — which suggests it as the ultimate personalized gift. A high-end nylon polyamid is used to create this attractive piece (in eight different colors) — and it’s the culmination of a lifetime of artistry. 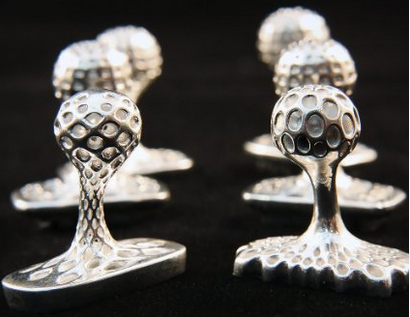 A Canadian software engineer (and “a maker by nature”) spent almost 20 years crafting traditional clay sculptures and pottery before deciding to experiment with the new medium of 3-D printing. 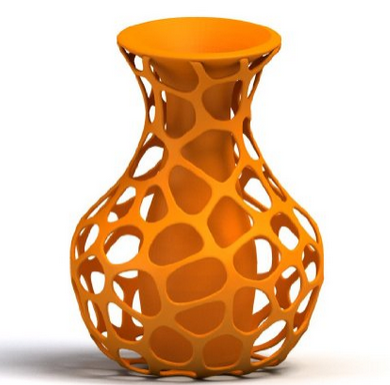 “I created The Hybrid Core Vase when I was looking for a vase to print for my wife and couldn’t find anything elegant,” explains its page on Amazon. 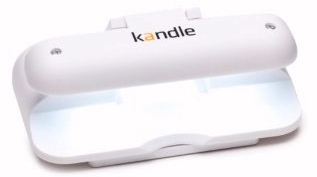 I had a lot of fun writing about gift ideas for Kindle owners. 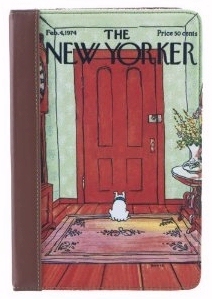 (There were covers that looked like an old-fashioned book — and some that made your Kindle look like you’re reading The New Yorker.) 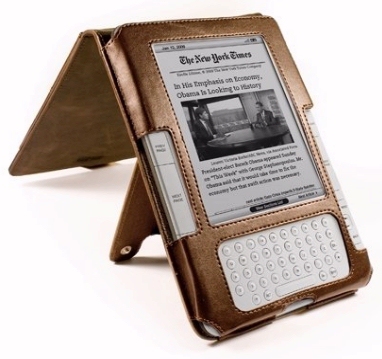 But this opened my eyes to a new world of Kindle accessories, and with some more research, I discovered some even more spectacular ways to customize and accessorize a Kindle. 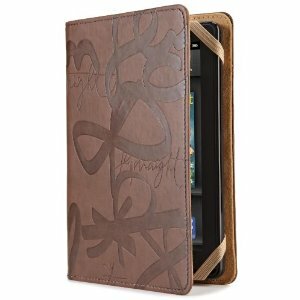 You can give your Kindle a special “arts and crafts” feel using vinyl skins (backed with adhesive) that you apply to completely cover the outside of your Kindle. 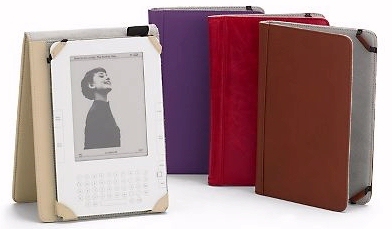 This design is called “Her Abstraction”, and its page in the Kindle store promises it can reduce the glare from your Kindle’s hard plastic edges, and also prevent fingerpints (since the vinyl is coated with a special protective layer of matte). On the 4th of July, I read the Declaration of Independence on my Kindle. 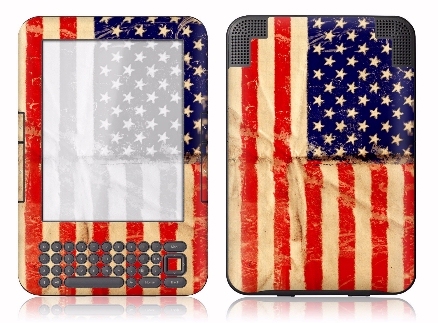 But imagine how patriotic I’d feel if my Kindle actually looked like an American flag. 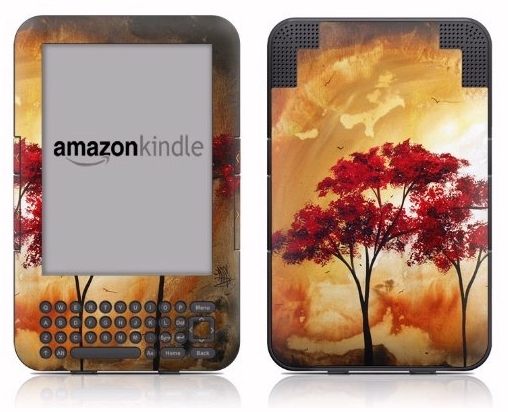 For $19.99, a manufactuer named “GelaSkins” offers a long line of arty “protective skins” for your Kindle, but the main difference is these vinyl skins actually cover your Kindle’s screen. 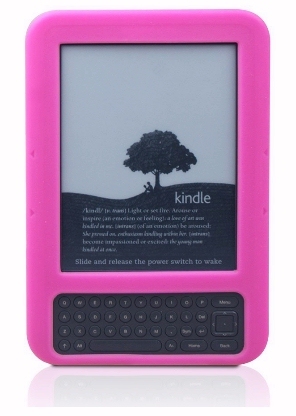 The idea is to protect it from scratches when the Kindle is in transit. (Its description on Amazon.com promises it can be removed and re-applied “with no residue”.) 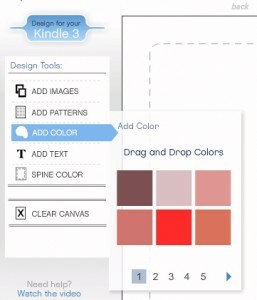 You can change the look of your Kindle again and again by switching from one skin design to another. She married (and then divorced) a German prince, and re-married a commoner in 2001. 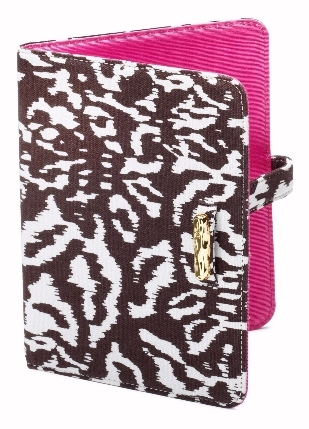 But along the way, Diane von Furstenberg built an international reputation as a fashion designer — and in April, she released a line of purse-shaped “clutches” for the Amazon Kindle. 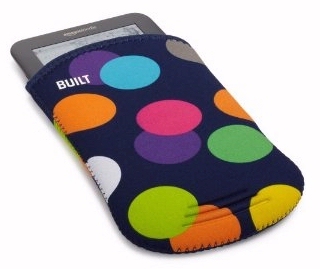 “Signature,” plus a soft blue one with patches of white that’s called “Spotted Cat.” There’s actually a purse-style clatch that can hold the case shut, and when it folds open, you can hold your Kindle like a book — and there’s even a pouch to hold business cards. Do you know a fan of major league baseball? 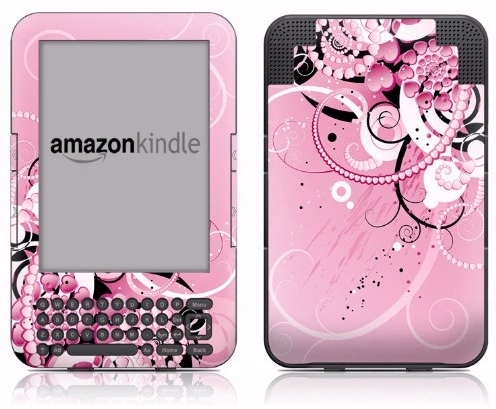 Nearly every team has a protective Kindle skin for sale in Amazon’s Kindle store, courtesy of a company called Skinit. There’s the Minnesota Twins (pictured above), the New York Yankees, and of course, this year’s World Series Champions, the San Francisco Giants. 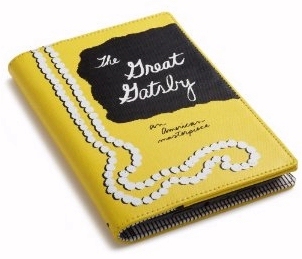 Each one adds the familiar red stitches of a major league baseball to the front edges of your Kindle — and adds a team logo to the back, using an easily-removable vinyl skin. The offerings aren’t just limited to baseball. 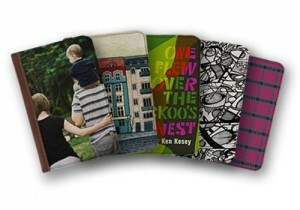 SkinIt offers vinyl Kindle skins with lots of NFL Football teams, NBA basketball teams, and even NCAAF college football teams. 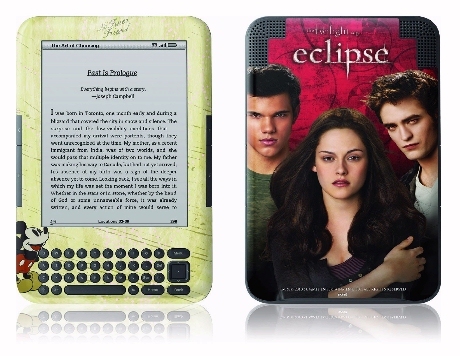 And last month, they even began offering a Kindle skin with pictures of the vampires from Twilight — and another one with Mickey Mouse! 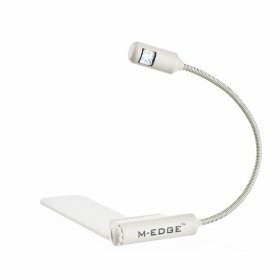 They’re sold separately, of course…!